What Happens When You Wear a Weight Vest? A weight vest is a valuable fitness accessory that can be used for a variety of reasons. Some people wear such a vest during normal exercise for improving strength and losing weight. Athletes preparing for specific sporting events or to reach certain goals during training also use a weight vest. A weight vest is just what it sounds like, a heavy vest that contains weights. You can wear it on your torso to add resistance to your workouts, which causes your body to work harder. The heaviness of a weight vest can vary and the weight you use would depend on your fitness level. Weight vests can be bought as light as 1/2 pound or as heavy as 30 pounds, according to FitStream. Some are adjustable, allowing you to add or remove weight as needed. You can wear a weight vest during workouts to help build muscle while also burning fat and calories. Weight vests can be especially helpful for burning calories during cardio workouts, such as running, since they intensify aerobic exercise, notes FitStream. You can even wear a weight vest on your daily walks to simply increase the workout's intensity and burn more calories, according to a study published by the journal "Medicine & Science in Sports & Exercise." Weight vests fit snugly to your body, making it possible to wear one during most types of exercise. 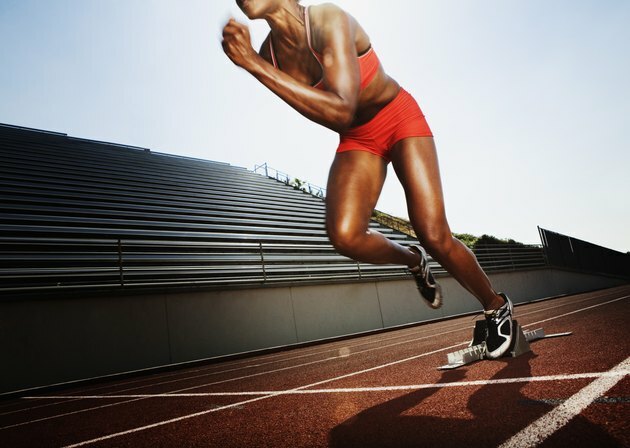 Runners rely on their strength and endurance to make it through a run. Some runners use a weighted vest as a tool for resistance training. When you run with the extra weight of the vest, your body adapts to this and learns to carry you and that additional weight, which can improve your endurance and overall fitness level. When you take the vest off, instantly losing that excess weight, your body is able to run more efficiently and for longer distances. Add a weight vest to your fitness training to improve your vertical jump, suggests FitStream. If you do weighted squat jumps while wearing a weight vest it can improve your strength. This is thanks to the additional weight around your torso, according to VerticalJumping.com. When you wear a weight vest, your body is tricked into believing that it weighs more and must adapt to that weight. After you take the vest off and jump, your body still reacts as if the excess weight from the vest is there, which results in higher and faster jumps.